Small changes in the layout of your worksheet can give you big improvements in readability. Insert and delete rows, columns, and cells to organize your worksheet. Select the letter at the top of a column to select the column. Or, right-click the top of the column, and then select Insert. Note: Excels inserts a new column to the left. Select Home > Delete > Delete Sheet Columns. Or, right-click the top of the column, and then select Delete. Select the row number to select a row. Select Home > Insert > Insert Sheet Rows. Or, right-click the selected row, and then select Insert. Note: A new row is inserted above the selected row. SelectHome > Delete > Delete Sheet Rows. Or, right-click the selected row, and then select Delete. Right-click the selected cells, and then select Insert. 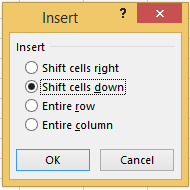 Shift cells right – shifts cells right to make space for the new cell(s). Shift cells down – shifts cells down to make space for the new cell(s). Entire row – inserts a new row. Entire column – inserts a new column.